The industry’s latest advancement in hot runner technology delivering peak performance and ultimate precision. Ideal for molding with today’s challenging abrasive, corrosive, shear and temperature sensitive resins like PC, POM & PBT. 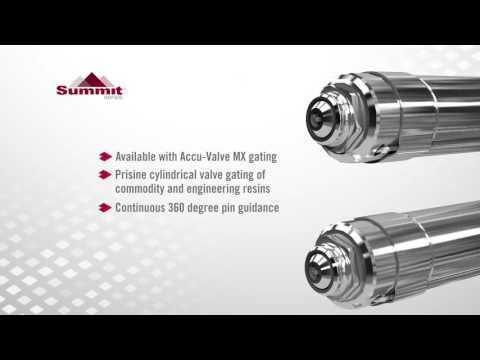 Summit-Series is critical for demanding Medical, Personal Care and Technical molding applications. Superior thermal profile (5% max variation*) More info. Ideal for molding shear and temperature sensitive resins. Exceptional process control and repeatability. Greatest resistance to corrosive and abrasive resins. Helps prevent contamination defects from premature wear. Standard in all Summit-Series systems. Reduces energy consumption by up to 29% (vs. steel pads). *Based on internal lab test results.